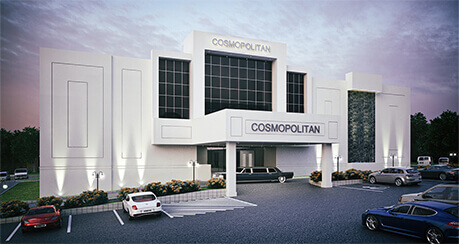 As a versatile event space, Cosmopolitan in Wayne, NJ redefines style. We offer the perfect venue to celebrate your special day. At our banquet facility, we offer spacious rooms, amidst chic, contemporary decor creating a great ambiance for any event. Our lush, manicured gardens and grounds provide a stunning setting for ceremonies or just for beautiful photography. Cosmopolitan in Wayne, NJ has everything that makes our banquet facility a preferred destination for any social or corporate event. Experience the luxury and style we offer, with the utmost elements of hospitality, including knowledge, ambiance, taste and courtesy. We strive to provide our customers with exquisite cuisine, focused execution and outstanding service. Our fundamental principles, of providing great food and outstanding service, contribute to the unique individualized experience we offer at Cosmopolitan. Our facility has a magnificent 5,000 square foot grand ballroom with a sweeping staircase accommodating up to 400 guests. Our Four Seasons room exhibits simple elegance, a perfect space for events of 60 - 180 guests. Our award winning culinary team will add innovation and creativity to make every dish extraordinary.